Sen. Ted Cruz (R-Texas) speaks at Friday's Republican Party of Iowa Reagan Dinner at the Iowa Events Center in Des Moines, Iowa. AKRON, Iowa - Texas Sen. Ted Cruz became the hottest thing in tea party politics this year -- and the favored son of some activists -- almost overnight. But after two days of events across Iowa, it is clear that using the state as a springboard to the White House in 2016 won’t come nearly as easily as his national fame. At a big speech to the state party's fundraising dinner Friday, the reception was warm but muted. The western Iowa party activists and businessmen he hunted with Saturday morning were complimentary - yet more curious than fervent. And supporters of Rep. Steve King, R-Iowa, who greeted Cruz at a joint fundraising lunch, cheered him - but several admitted they knew little about him. NBC's Kasie Hunt asks Sen. Ted Cruz, R-Texas, about a possible 2016 presidential run during his pheasant hunting outing with Rep. Steve King, R-Iowa, who faces re-election this fall. Sam Clovis, who's running for the open U.S. Senate seat in Iowa and who attended portions of all three of Cruz's events, summed it up: "People just don't know him yet." Cruz has unmistakable influence in Washington and at home in Texas. But his brief run on the national stage has given him a high profile that's still bereft of the deep relationships that would be necessary to turn him from a television figure to a flesh-and-blood leader of conservatives in Iowa. Cruz, it seems, is working hard to change that – though officially, he says he is focused on the Senate, where he has served since January. "One hundred percent of my focus is on the U.S. Senate, because I don't think we can continue down the road we're on much longer, and so that's my attention," he told NBC News on Saturday before heading out on his first pheasant hunt. And, of course, he still has plenty of time -- the first votes in Iowa's caucuses are still two years away. But in public and behind the scenes, Cruz this weekend was putting in the kind of time and effort it takes to win over voters who are accustomed to hosting - and testing - the most venerated public figures. "This is not the first high -profile person to come walking through the state, and we're pretty judicious. We'll kick the tires; we'll listen; we'll watch," said Bob Haus, a longtime Iowa Republican operative who worked for Texas Gov. Rick Perry when he ran for president in 2012. Then, he made a late-night trip along I-80 to tiny Akron, Iowa, ahead of a morning pheasant hunt hosted annually by King. After three hours of trekking through the brush, he spoke for another half an hour at a luncheon at the convention center in Le Mars, a town famous for an ice cream parlor that regularly draws GOP presidential hopefuls. Sen. Ted Cruz (R-TX) mugs with VIPs at a photo opportunity prior to an annual dinner in Des Moines, Iowa, Friday. This weekend was his third appearance in the state in the past three months. Earlier this year, activist Becky Beach, who typically hosts Sarah Palin on her Iowa visits, organized a group of influential GOP activists and donors to meet with Cruz. In another visit, he appeared at a summit sponsored by the Family Leader, the group led by longtime evangelical leader Bob Vander Plaats. 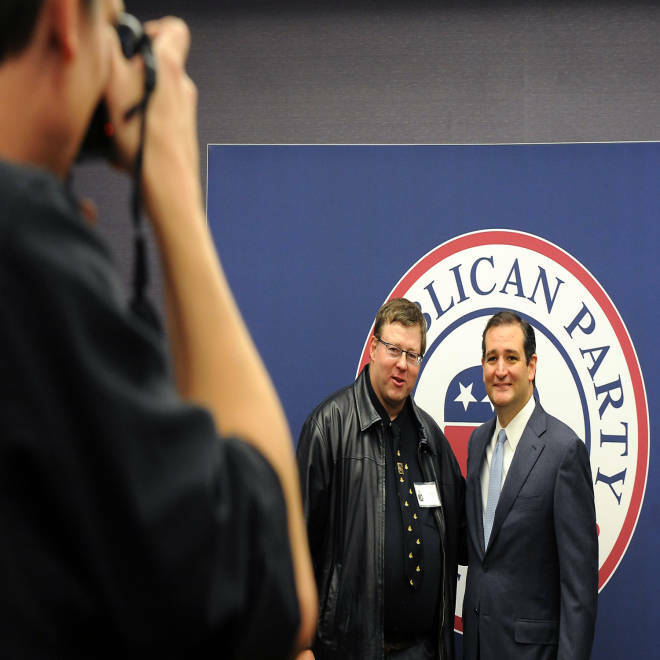 Cruz has also been working the Iowa angle since at least the time of the 2012 GOP convention: He met with the state delegation in Tampa, where one of King's hunting buddies said he first met Cruz. In his public appearances, Cruz defended the "defund Obamacare" strategy that led to a government shutdown and a near default on the U.S. debt. He urged the party to focus on base voters and reject moderation in order to win elections in 2014. But he was also clearly trying to broaden a message that critics on both sides of the aisle say alienates swing voters that are key to winning national elections. "I think principles of liberty and growth unify Republicans and bring Republicans together, whether you're talking about the evangelical community or the liberty movement, whether you're talking about the business community, Main Street or the tea party," he told local and national reporters Friday, echoing a theme mentioned in his speech. "I think if you focus on economic growth on opportunity and on liberty - that's how we unify the party, but it's also how we turn the country around." 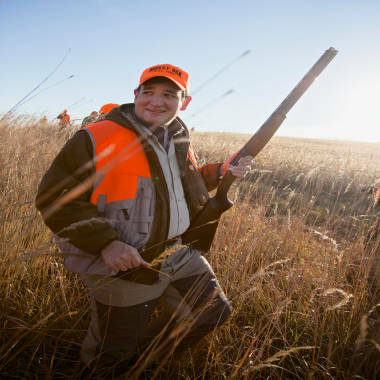 Sen. Ted Cruz (R-Tx) walks through tall grass during a pheasant hunt hosted by Rep. Steve King, R-Iowa, on Saturday. What reputation Cruz does have, is more divisive: "There are a lot of people who would like to shoot me and you, I've noticed," King said to Cruz before they left for their hunting trip. “That would be a fundraiser to end them all, wouldn't it?" 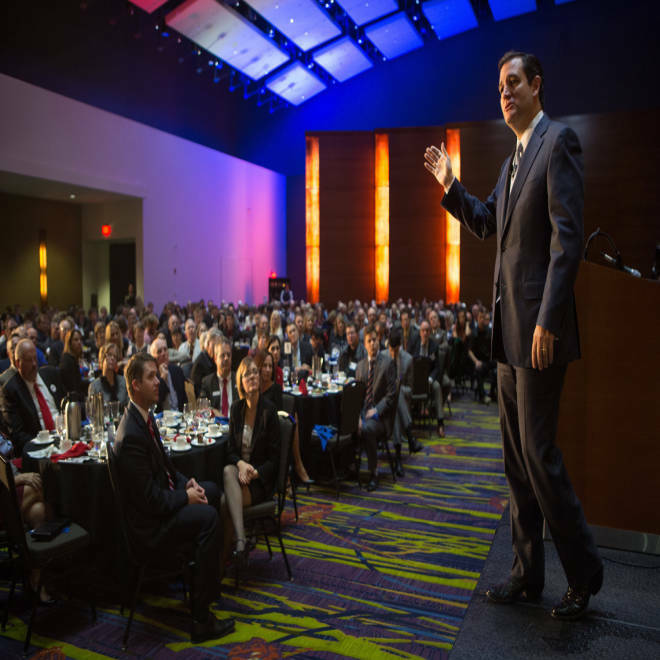 But while Cruz is clearly at ease onstage with a microphone - he talked for 45 minutes without any notes during the Friday night dinner - and impressed many in the audience with his oratorical skills, he appeared less comfortable making small talk during the kind of unstructured events where many successful Iowa candidates build their most significant bonds. For example, he skipped the early breakfast that King holds in the Hole In A Wall Lodge before the hunt. Instead, he came down for the scheduled 8 a.m. start and ate quickly by himself at the bar while chatting with King. That's a contrast with others, such as Perry, who accompanied King on this hunt in 2011 when he was a presidential candidate and spent the early morning hours in the darkened lodge chatting with other hunters and reporters. A spokesman for the Texas senator later cited the late night drive before the hunt as the reason for his absence at breakfast, and said the senator wasn't feeling well over the weekend. On the hunt itself, at which several reporters trailed Cruz with cameras, he seemed only to chat with his fellow hunters briefly and in hushed tones, at one point discussing a former clerk to Supreme Court Justice Antonin Scalia as "a principled conservative." Cruz and King discussed loyalty in electoral politics as they pushed through the underbrush, both agreeing that "you never forget who was in the first foxhole with you." Cruz was careful not to exaggerate his familiarity with hunting -- "I enjoy hunting, but in the world of experienced hunters, I don't stack up," he said -- but he was at ease with the culture and didn't hesitate to shoot when a member of the group spotted a bird and shouted, "rooster!" Cruz used his own shotgun -- flown up from Texas as checked baggage on his United flight. He hit two pheasants himself and cheered others along the way. "Someone make a pillow!" Cruz said when one bird fell from the sky in a hail of feathers. "Or just turn it straight into McNuggets." NBC News' Andrew Rafferty contributed to this report.